As of this morning, this blog is seriously in danger of becoming a “dream journal.” At least, until I can shake this disturbing trend of Lynchian horrorscapes. Eventually a man picked up the telephone and I tried to give him the address of the Church. We laughed about GPS and how difficult it was to pin down exact locations and then we were both standing there, in front of the building. 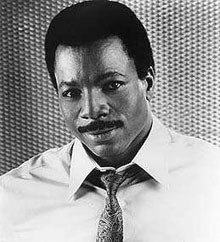 The cop had an amazing mustache and likely looked like Carl Weathers (thanks to a friend for passing on a clip from Arrested Development — just google “carl weathers stew” and you’ll know how this entered my dreams). We stood in the rain and looked at photographs of the building from different eras and then he was gone. My wife and I enter the building and stumble into a tour group entering the elevator. Thinking we are sneaky, we slip in with the group and ascend to the top floor. As we exit the elevator, we learn this is an estate sale of sorts. The realtor/saleswoman — mid-fifties, close-cropped black hair, mini-glasses, baby-blue knee-length mid century dress — waves her arms around and demands we leave our belongings in the hall. We enter into a gymnasium filled with shelves that reach thirty feet into the air, filled mostly with giant, colorful boxes, depicting feudal Japanese battles, superheros in flight, martian landings…all surrounded by plantlife of all sorts. Before we know it, the lights have been shut off and we are told it is time to turn in. The masses begin pulling out their sleeping bags and settling in for the night. A high pitched whirr emits from speakers in the ceiling, followed by a strange 8-bit melody. We attempt to sleep with the others, but A. insists we wander the various rooms and vaults to find undiscovered goodies. I look in cabinet after cabinet and find only VHS tape sets of exercise videos and row after row of board games sealed in plastic. There is a tome of what looks like Greek mythology, written on a fleshy, brown paper that tears as I flip through the pages. I peer at a novel, what looks to be fan fiction from the John le Carré universe. It is a four-volume series whose cover features an old man in a raincoat peering around the corner suspiciously, a sullen catchphrase blazing across his chest. A. tells me that she has moved the baby to sleep in a different room and I panic, demanding she take me to him. We head back to the elevator and descend (or was it ascend?) to yet another auction floor. This level is a mostly open space with several cubicles surrounding the outer edges. We stumble past more sleeping bags and passersby talking about their selections, and finally enter a room with a dodgy paint job and a giant rusted crib, sitting in the corner by a drafty window.